Welcome to the Klamath Tribal Water Quality Consortium (formerly known as the Klamath Basin Tribal Water Quality Work Group) website, which is designed to inform the public about Klamath River water quality problems and how to solve them. The Consortium, made up of leaders of five Tribal water quality or environmental departments, collaborates on larger basin-scale water quality issues such as Klamath Hydroelectric Project (KHP) and Clean Water Act implementation (TMDL). Other regulatory processes relevant to water quality, such California Department of Fish and Game Incidental Take Permits (ITP) for coho salmon, are also discussed on this site. 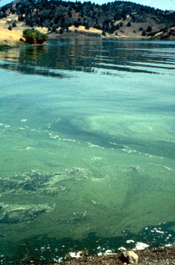 The Consortium participants have conducted numerous complex scientific investigations concerning Klamath River water quality impairment since the group’s inception in 2003. This website presents Tribal studies, as well as continuing scientific discoveries by agencies, academic institutions and non-governmental organizations (see new science). It also provides a portal for tracking important governmental and regulatory processes that affect Klamath River water quality, fisheries and Tribal Trust resources. The Consortium is comprised of the heads of environmental departments of the Yurok, Hoopa Valley, and Karuk Tribes, the Quartz Valley Indian Community, and the Resighini Rancheria. Following a massive adult salmon kill in September 2002, the Tribes formed the Klamath Basin Tribal Water Quality Work Group (Work Group). The Work Group's stated purpose was "to prevent future disasters through sound scientific research, data analysis, and thorough planning." In 2015 the Work Group decided to formalize its collaboration by creating the Klamath Tribal Water Quality Consortium and adopting a Strategic Plan and Bylaws. While the Consortium collaborates on research and shares information it takes no collective positions, but defers to individual Tribes to offer policy statements. Each Tribe exercises authority over Reservation waters (see Tribal WQ Authority). Some Tribes also acquire designated authority as co-managers of water quality from the U.S. Environmental Protection Agency. The indigenous people of the Klamath River Basin have lived in harmony with the river and the adjoining lands for thousands of years. They Klamath River Tribes owed their prosperity, in large part, to the river's abundant runs of salmon and other fish species. 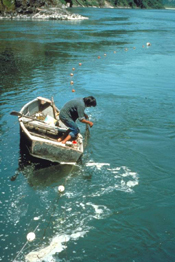 The Tribes in California below the Lower Klamath River Tribes maintain active fisheries today, which are often a mainstay of Tribal subsistence and also an important economic factor. The Tribes all depend upon a healthy river to support a broad range of cultural and ceremonial activities, many of which are not yet recognized or protected by State and federal environmental protection policies. The Klamath Tribes of Oregon are not Consortium members but cooperate with Lower Klamath Basin tribes on many water quality related issues.